American orbital launch vehicle. 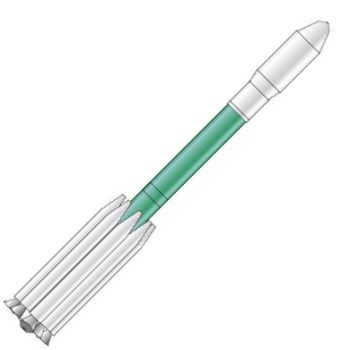 Version of Delta 7000 using much larger GEM 46 solid rocket motors originally developed for the Delta 3. Status: Active. First Launch: 2003-08-25. Last Launch: 2011-09-10. Number: 3 . Payload: 1,816 kg (4,003 lb). Thrust: 4,510.00 kN (1,013,880 lbf). Gross mass: 286,000 kg (630,000 lb). Height: 39.00 m (127.00 ft). Diameter: 2.44 m (8.00 ft). LEO Payload: 1,816 kg (4,003 lb). Payload: 1,000 kg (2,200 lb) to a earth escape. Family: orbital launch vehicle. Country: USA. Spacecraft: LM-300, SA-200, MER, SIRTF, GLAST. Launch Sites: Cape Canaveral, Cape Canaveral LC17B. Stages: Delta Thor XLT-C, Delta K, GEM 46, Star 48. Agency: Douglas. 2003 August 25 - . 05:35 GMT - . Launch Site: Cape Canaveral. Launch Complex: Cape Canaveral LC17B. Launch Pad: SLC17B. LV Family: Thor. Launch Vehicle: Delta 7920H. SIRTF - . Mass: 923 kg (2,034 lb). Nation: USA. Agency: NASA. Class: Astronomy. Type: Infrared astronomy satellite. Spacecraft: SIRTF. USAF Sat Cat: 27871 . COSPAR: 2003-038A. Originally to have launched January 9, 2003. Delayed six times. The Space Infrared Telescope Facility (SIRTF) was the last of NASA's 'Great Observatories'. It had a 0.85-meter infrared telescope, with a liquid-helium cooled focal plane carrying the three main instruments. SIRTF was launched by the second Delta II Heavy. The second stage entered a 166 x 167 km x 31.5 deg Earth parking orbit, and after about 33 minutes of coast, passing south of Madagascar, restarted at 0613 UTC to enter a hyperbolic orbit with a perigee of 170 km, an eccentricity of 1.0061, and a velocity of 11.05 km/s. This placed it in a solar orbit of 0.996 x 1.019 AU x 1.14 deg with a year about 4 days longer than Earth's. 2008 June 11 - . 16:05 GMT - . Launch Site: Cape Canaveral. Launch Complex: Cape Canaveral LC17B. Launch Pad: SLC17B. LV Family: Thor. Launch Vehicle: Delta 7920H. Fermi Gamma Ray Space Telescope - . Payload: SA-200HP. Mass: 500 kg (1,100 lb). Nation: USA. Agency: Martin. Class: Astronomy. Type: Gamma ray astronomy satellite. Spacecraft: SA-200. USAF Sat Cat: 33053 . COSPAR: 2008-029A. Apogee: 562 km (349 mi). Perigee: 542 km (336 mi). Inclination: 25.60 deg. Period: 95.70 min. Gamma-ray Large Area Space Telescope; renamed Fermi GST after launch..
2011 September 10 - . 13:08 GMT - . Launch Site: Cape Canaveral. Launch Complex: Cape Canaveral LC17B. Launch Pad: SLC17B. LV Family: Thor. Launch Vehicle: Delta 7920H. Grail A Ebb - . Mass: 202 kg (445 lb). Nation: USA. Class: Moon. Type: Lunar probe. Spacecraft: LM-300. Decay Date: 2012-12-17 . USAF Sat Cat: 37801 . COSPAR: 2011-046A. NASA dual-spacecraft lunar gravity mapping mission. Grail A was deployed from the Delta upper stage at 14:28 GMT and Grail B at 14:37 GMT. The spacecraft reached the Sun-Earth L1 point 1.5 million km from Earth and then fell back towards the Moon. Lunar orbit insertion was at 01:00 GMt on 1 January 2012 for Grail A, and at 02:00 GMT on 2 January for Grail B. After completing their mission, the satellites were intentionally crashed onto the lunar surface at 75.62 deg N / 26.63 deg W on 17 December 2012 at 22:29 GMT. Grail B Flow - . Mass: 202 kg (445 lb). Nation: USA. Class: Moon. Type: Lunar probe. Spacecraft: LM-300. Decay Date: 2012-12-17 . USAF Sat Cat: 37802 . COSPAR: 2011-046B.